Featuring Deep Drawn Seamless Sink Bowls Featuring Perforated Drainboard All Sinks Are NSF Approved PRB-24 Series 25” Wide Units With Deck Mount Faucets     Underbar Sinks baR sinks Featuring 10” x 14” x 10” Deep Drawn Seamless Bowls & 29” Working Height All Faucets Included Meet Federal Lead Free Standards   • 7” High Backsplash • Removable Perforated Drainboard Top • 9” Overflow Pipe w/ 1 1/2” IPS Drain Included Per Sink Bowl • Sound Deadened • Stainless Steel Top, Apron, Sides • Stainless Steel Legs w/ Adjustable Stainless Steel Bullet Feet • Adjustable Stainless Steel Side Cross-Bracing • PRB-19 Series Includes 1 - 4” O.C. Splash Mounted Swing Spout Faucet • PRB-24 Series Includes 1 - 4” O.C. Deck Mounted Swing Spout Faucet & Has Rear Deck For Extra Storage PRB-19 Series with Drainboards Shown 20” Wide Units Include Splash Mount Faucet(s)  L And R Indicate Sink Location. C Indicates Sink Is Centered. 2 COMP. w/ SPLASH MOUNT FAUCET w/ DECK MOUNT FAUCET Spout Length O.A. Length PRB-19-42LorR PRB-19-42C 1948 1948 6” PRB-24-32LorR 6” PRB-24-42LorR 6” PRB-24-42C 1930 2051 2051 6” 36” 6” 48” 6” 48” # of Drbds. 1 1 2 Drbd. Approx. Weight 11” 89 lbs. 23” 105 lbs. 12” 105 lbs. Approx. Cu. Ft.                            20” WIDE Price Spout Length 25” WIDE Price Length                                                                            1 COMP. PRB-19-31C $1719 6” PRB-24-31C $1815 6” 36” 2 12” 89 lbs. 12             PRB-19-22C 1725 6” PRB-24-22C 1775 6” 24” N/A N/A 89 lbs. 8  PRB-19-32LorR 1854 12  16  16           3 COMP. PRB-19-33C 2002 2486 10” PRB-24-33C 10” PRB-24-53LorR 2069 2632 12” 36” N/A N/A 105 lbs. 12  PRB-19-43LorR 2277 10” PRB-24-43LorR 2381 12” 48” 12” 60” 1 1 11” 107 lbs. 23” 125 lbs. 16  PRB-19-53LorR 20  PRB-19-53C 2548 10” PRB-24-53C 2697 12” 60” 2 12” 125 lbs. 20  PRB-19-63C 2680 10” PRB-24-63C 2754 12” 72” 2 18” 143 lbs. 24  PRB-19-73C 2785 10” PRB-24-73C 2895 12” 84” 2 24” 190 lbs. 42  PRB-19-83C 3317 10” PRB-24-83C 3476 12” 96” 2 30” 176 lbs. 48             PRB-19-44C* PRB-19-74C* PRB-19-84C* 2498 3165 3733 6” PRB-24-44C* 6” PRB-24-74C* 6” PRB-24-84C* 2584 3291 3893 6” 48” 6” 72” N/A N/A 107 lbs. 16  4 COMP. PRB-19-64C* 3051 6” PRB-24-64C* 3157 2 12” 147 lbs. 24  6” 84” 2 18” 163 lbs. 42  6” 96” 2 24” 178 lbs. 48  *4 Comp. 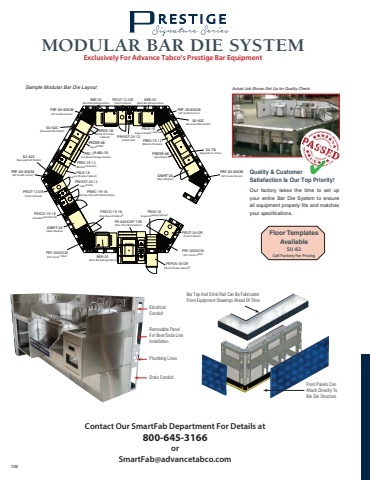 Bar Sinks Include 2 - 6” Swing Spout Faucets baR sink accessoRies & ModiFications SU-73 Add Mirror Finish (Factory Install Only) SU-74 All Stainless Steel Construction Upgrade SU-75 Add Welded Stainless Steel Cross-Bracing SU-79 Additional Drainboard Length $408 486 117 136 Lin Ft. SU-20R or L SU-20RL SU-25R or L SU-25RL Right Or Left Side Splash For PRB-19 Series $179 Right & Left Side Splash For PRB-19 Series 375 Right Or Left Side Splash For PRB-24 Series 213 Right & Left Side Splash For PRB-24 Series 402   102 WARNING: Equipment that includes a faucet may expose you to chemicals, including lead, that are known to the State of California to cause cancer or birth defects or other reproductive harm. For more Info.,visit www.p65warnings.ca.gov.